They are renthal fat bars with the jacket up back end they need them with the bar risers to make it nice to ride and normal bars just look a bit week and spindle next to fat bars . Well in between rotations of the camera I saw the girl...but then also saw the V-due on an elevated background...I presume these were the same boys who came in "third" behind our Runners Up place at the manchester Show this year???? I'm that sad though I replayed the video just to check out the V-due again...Oops.. Hear are a couple more with the V due on show . Hello ladies Wish I'd gone now, I did intend to go with some friends, but other things stopped me. 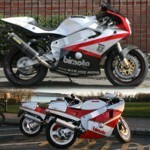 I've also noticed the Bimota banner, isn't that the one we used at Manchester? Yes it is the very same it just adds a little something extra behind the bike. Of course the Bimota stand has the best bikes and will always win our little stand with the small bikes but the due is out coolest bike that no one has ever seen before we have taken it to 2 shows this year . I must admit I had a look around your stand at Manchester. Some lovely bikes and mods to them, there's several bikes I'd like in my garage. I'm involved with Derby Phoenix racing and we have the pleasure of holding several 'two stroke GP's'. Fantastic machinery - Rotax, RD500's, RG500's, TZR250 SP's, etc, etc. Full grid of awesome bikes! Ever seen this website? Ranks most popular websites and gives them a value?? How do people come up with such junk??? That's place that its all happening. but it shows you get a lot of viewings on hear. I don't come on a lot as im only interested in 2 strokes and the V due section never has anything new in it . But I figured every one like a babe no matter what she's sitting on .